The story of 1961 was, of course, the duel between Yankee teammates Mickey Mantle and Roger Maris for the American League home-run title. 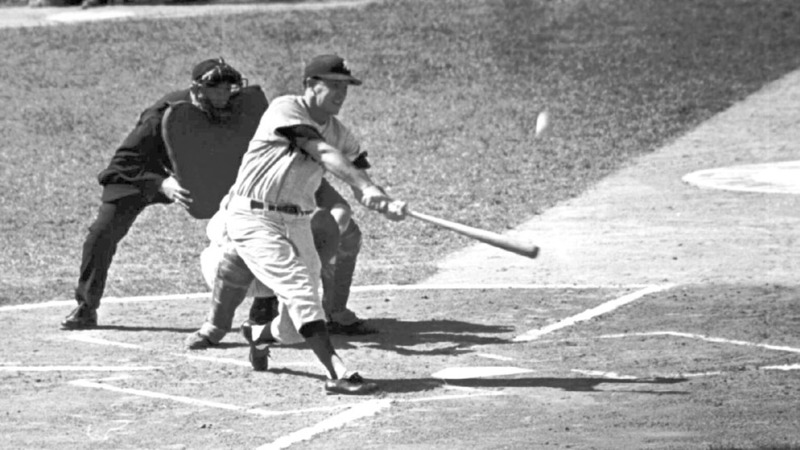 An ailing Mantle missed the last week of the season, and Maris walloped his 61st homer on the season's final day to break Babe Ruth's 34-year-old Major League Baseball record. Not coincidentally, the Bronx Bombers won 109 games and held off the surprising Detroit Tigers, who won 101 games themselves. The Reds, meanwhile, grabbed first place for good in early August, and finished four games ahead of the Dodgers. The World Series opened in New York, where Elston Howard and Bill "Moose" Skowron provided all the offense with a solo homer apiece. That was plenty for Yankee ace Whitey Ford, who came through with a nifty two-hit shutout. The Yanks again scored two runs in Game 2, but this time it wasn't nearly enough, as the Reds scored six of their own, first baseman Gordy Coleman and catcher Johnny Edwards both knocking in a pair of runs. Joey Jay allowed just four hits to earn the 6-2 decision. In Cincinnati for Game 3, the Reds led 2-1 after seven innings. But in the top of the eighth with two outs, pinch-hitter Johnny Blanchard homered into the right-field bleachers to tie the game, and then Maris led off the ninth with a solo shot to practically the same spot. Luis Arroyo won the game, 3-2, with two innings of scoreless relief. Whitey Ford started Game 4, and again he was brilliant. He left with an ankle injury after the fifth inning, with a 2-0 lead and a streak of 32 straight scoreless World Series innings. Ford's replacement, Jim Coates, was just as good, allowing just one hit over the next four innings, the Yankees winning 7-0. The Yankee bats ruled Game 5. Skowron knocked in three runs, Hector Lopez drove home five (three of them on his fourth-inning homer), and the Bombers took an easy 13-5 victory to clinch the Series and yet another World Series.